Can a nursing home tie my dad to a wheelchair if he has had episodes of wandering around the facility? After a recent post about a nurse tying a resident to a wheelchair with a bed sheet, I received several emails from concerned people regarding the use of restraints in nursing homes with their loved ones. Restraints among nursing home residents are only permitted when a physician orders them to protect the resident and with the approval of the resident or his representative. Federal law prohibits nursing homes from using restraints for the convenience of the facility or as a way of punishing the patient. (Code of Federal Regulations, 483.13(a). A restraint is considered to be: “any manual method or physical or mechanical device, material or equipment attached or adjacent to the resident’s body that the individual cannot remove easily which restricts freedom of movement or normal access to one’s body.” According to this definition, almost all medical equipment found in a nursing home could be used in this capacity to restrain a patient. Rather than rely on restraint devises, staff in the nursing home should re-direct patients who have a tendency to wander. If staff are unsuccessful in their attempt to re-direct, they should use electronic devices such as bed / chair alarms to alert them when a patient begins to move from the area where he was sitting / sleeping and the help the staff keep track of his whereabouts. Compared with the nursing homes of the past, the use of restraints in nursing homes today is relatively uncommon. Much of the reduction in use of restraints can be credited to studies that have demonstrated that the use of restraints in nursing home patients can be not only de-humanizing, but also downright dangerous. 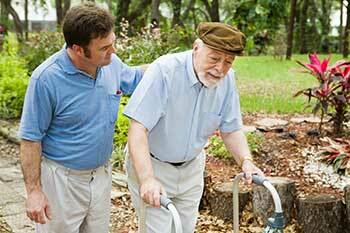 For more information on nursing homes in New York look here. For laws related to New York nursing homes, look here. They absolutely can NOT tie the patient with a bedsheet because he wanders. This nurse needs to be terminated and her licensure board notified. This practice violates several regulatory requirements including F-221, Right to be Free from Physical Restraints. I would highly suggest the family member speak with the administrator and director of nursing together to ensure the practice is terminated. If it isn’t, find another nursing home. My grandmother went through the same thing. Before she got sent to this nursing home, she was fine- just pacing and wandering a lot. My mom walked in to her tied down to a wheelchair with her arms behind her back and her legs tied down as well. This is SO wrong- they gave her 3 sleeping pills a day as well as other anxiety and psychotropic drugs that we DID NOT approve of. She couldn’t open her eyes, talk, or walk and was hallucinating. We took her out of the nursing home right away and she is now recovering at home. Love and care from family members is the best cure- she is now in much better condition from the nursing home but still not like before. It is such a shame. The doctor at this nursing home got furious when we threatened to call social services and threw the phone across the room and wouldnt allow us to take our grandmother home. This was at Goldstar Healthcare nursing home center at Chatsworth, Ca. I cant believe these places get away with this The worst part is that a large majority of these facilities are funded by our tax dollars. For god sake, the humane society treats animals better. Unfortunately for my family we are facing a similar problem. My grandfather has dementia and early signs of alhemizers. One of my aunts has power of attorney and we went to go visit him and they had him restrained to the wheel chair and had mittens on him that were dirty. When we asked if these were on due to a doctors order they said they couldn’t tell us they could only tell my aunt. They were on because he wandered outside the facility where they found him in the parking lot. While in the facility it reaked of urine and to note it looked like there was smeared poo on the floor beside his bed. The light in the bathroom was out, so not to sure how he or his other two room mates use the restroom at night. His clothes are missing, so all he had was the clothes on his back. Nobody knows where his cloths are. I’m trying to figure out how to get him transfered to a nicer facility. Does anyone know a website that will detail what rights my family and myself have even though my aunt has power of attorney. I actually took pictures of the facility while there and took vido on my phone of the nurses scrambling around trying to figure out who was the nurse that was supposed to take care of him. Any suggestions would be much appreciated. The facility is in Pomona California. Its called Ember Care Corp.
You may want to contact your ombudsman or the California Department of Health and report the poor care your grandfather is receiving at this facility. My brother is in Puerto Rico, they tide to the wheel chair, I like to know if they are permited to do this?